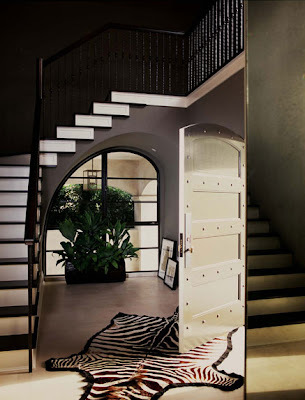 Above 3 pictures Mary McDonald zebra carpets in living areas and an entry foyer. 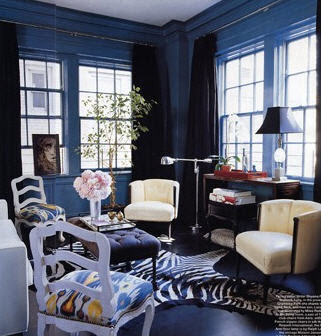 There is even a classic zebra inspired fabric that Brunschwig and Fils has done for years called "Le Zebre"
And what about a zebra striped ceramic stool? 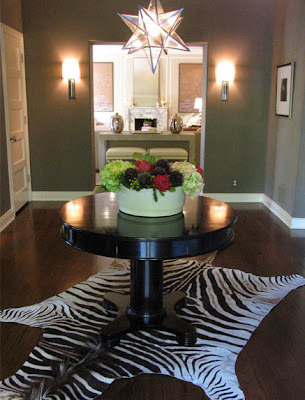 Pieced together these make a stunning large zebra area carpet, complete with straight edges. 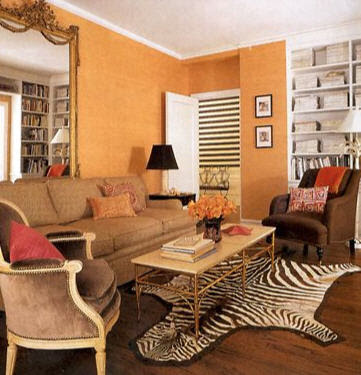 I love the orange sofa & ceiling, and the wall of shiny black bookcases. 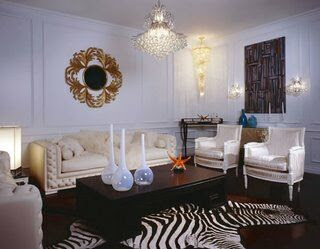 Postscript December 31 2007 I have to tell you that I am not a proponent for using real zebra carpets. I have learnt that they are indeed an endangered species. Let's leave them where they belong....in the wild. 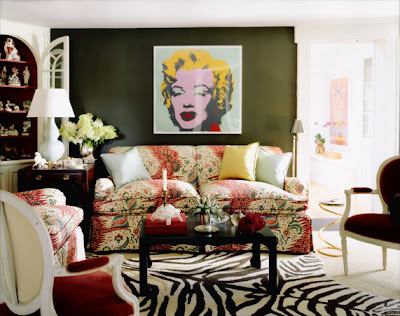 There are many good imitations that can be used, unless you are lucky enough to own a Vintage Zebra hide. Fantastic post, very exhaustive! I was thinking lately how much zebra has been around and was just about to do a post on it but you beat me to the punch. I'll just have to do it from a different angle now. Thanks for sharing such beautiful images with us. 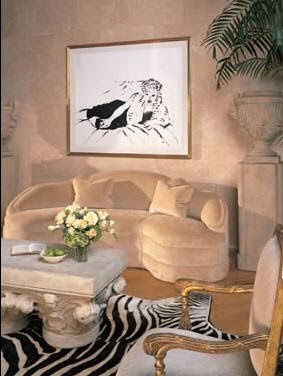 Yes please do a posting on zebra carpets from your own perspective. I would love to see it through your eyes. Nice to have you back, P! I almost did the zebra look in our new office space. I just couldn't pull the trigger. It was because I saw them everywhere. 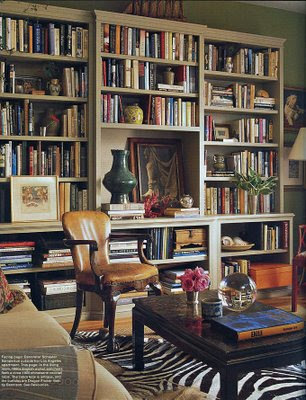 I pride myself on appreciating style, not trends...but as we've all discussed, so few people actually place these in their homes that it would be hard to call it a trend that has taken off anywhere except photo shoots and magazines. 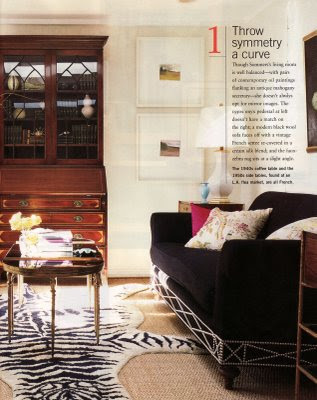 Either way, I still can't help but loving how they look and adoring them when used well in a space. 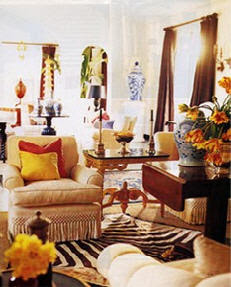 Burnhamn Design and Domino make such clever us of the rugs. 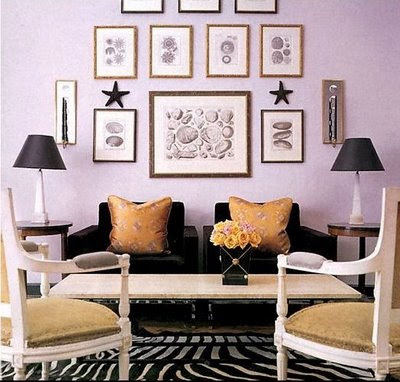 They accentuate, but don't dominate the space. Fetching. very nice array of resources and inspiration, Patricia. I hope the move went smoothly. Welcome back, Patricia! Great, thorough post. Love all the wonderful photos. 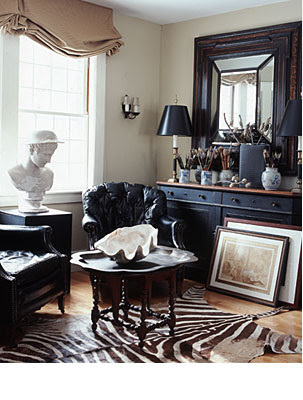 I think the zebra could make quite a statement in your office. 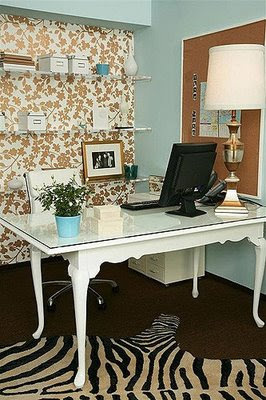 It is very unique to have in an office space and fun too. Good to be back posting after my move. I've always loved zebra! Great post and glad that you are back. So glad you're back, hope your move went well. Thanks for your inspiration via the pictures. 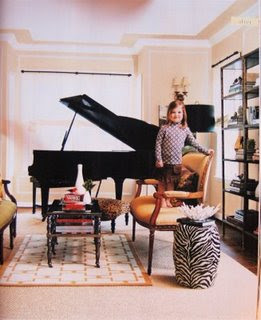 Stay tuned for your daughter as I will be doing more postings on Zebra inspirations. You're right there is always "next year". Wonderful, wonderful post!! So glad to have you back. Hope you are getting settled in! Thanks....and I am still getting settled in, lots more to do though. Nice, as long as it aint real! I am sad to say that zebras are indeed endangered. 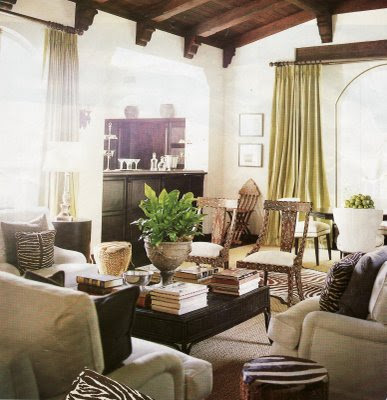 Use faux zebra rugs. 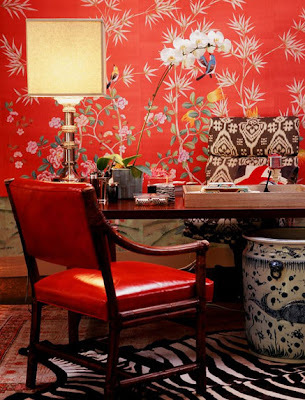 The patterned designs are sublime, and look absolutely splendid in a space. 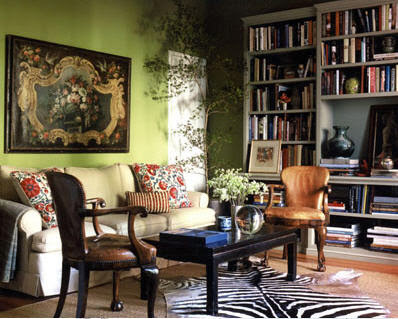 I love the look with splashes of color here and there. Pure luxe! I am agree, let's us Faux Zebra!! 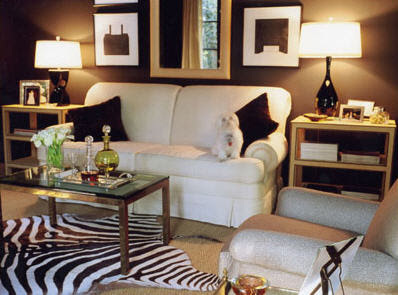 I'm finally moving out of my parent's house into my own condo and would love to have a zebra rug. 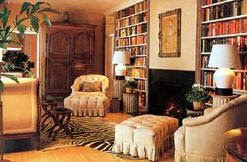 Can you suggest some Canadian (preferably Western Provinces) shops that carry some of these rugs? I'd love to get one but my budget would be at most $600. 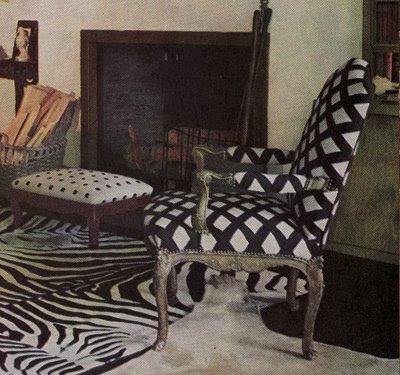 Wow, this is one of the best collections of zebra rug pics I've seen in a long time. 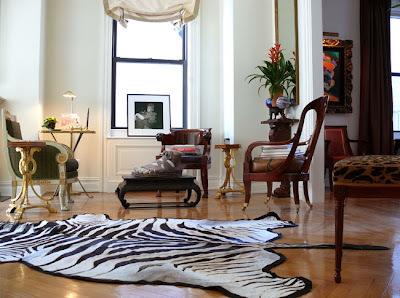 I too am completely in love with the zebra rugs. Hope to have one soon! Yes! 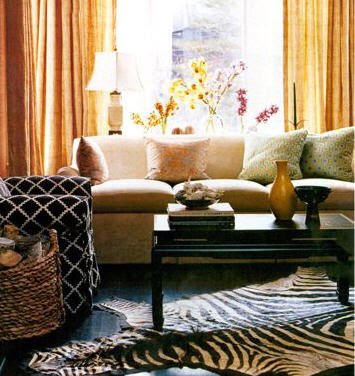 Not much sexier than zebra rugs. Just found your blog - Great post! Looking forward to reading more.